Neuschwanstein and Hohenschwangau castles are well known for their fairy tale-like appearance, but it’s their surreal location in Bavaria, Germany, that markedly enhances their beauty. These two castles, one the childhood residence of King Ludwig II, the other his extravagant creation, are perched on the hills in Schwangau, overlooking peaceful Alpsee Lake and the small resort village of Hohenschwangau. Surrounded by a dense forest, these castles are especially beautiful to visit on a cool, fall morning when the leaves’ vibrant colours are on display, the fog rolling in to create an air of mystery. If you’re anything like me, you’ll be overcome with excitement the moment you arrive in Hohenschwangau. As soon as I stepped out of the car, I looked up to the hills and saw the brilliant white of Neuschwanstein Castle, peeking through the swirling autumn fog. We quickly made our way up the sloped road to the ticket office to pick up our tour passes. With a little bit of time to kill before our tours started, we gladly walked around this delightfully tiny Alpine village and enjoyed the beautiful natural surroundings. The first castle we toured was Schloss Hohenschwangau, the nearer of the two castles. This was the summer residence of the Bavarian royal family, built by Ludwig II’s father, Maximillian II. King Max, as I like to call him, first discovered this site in 1829, when he was still Crown Prince. Back then, it was nothing but ruins of the fortress Schwanstein, dating back to the 12th century. King Max loved the natural beauty of this area so much that he acquired the historic site and began construction of his own castle here in 1833. Modelled after the neo-Gothic Tudor style of an English castle, Hohenschwangau is less theatrical than its sister castle further up the hill. However, the interior does have some unique qualities (I wish I could show you some pictures, but photos weren’t allowed). The Queen’s bedroom was not what I expected at all, but I loved it! Decorated in bright blues, pinks and reds, its design is reminiscent of King Max’s journey through Turkey and Greece in 1832/1833. The Kings’ bedroom, or “Tasso-Room” is also a little quirky. King Ludwig II installed a starry sky into the ceiling so at night he could lay in bed and enjoy the illuminated stars and moon! The summers that young Ludwig II spent at Hohenschwangau definitely made an impression on him. It was here he became enthralled by German sagas, legends and the musical dramas of Richard Wagner. Soon he began dreaming up fantastical plans for a castle of his own, which would come to fruition once he was King. Now King, Ludwig II would sit in his room in Hohenschwangau Castle and peer through a telescope, keeping a watchful eye on the construction of his uniquely personal, fairytale retreat- Neuschwanstein Castle. The interior of the castle can only be visited as part of a guided tour. Tickets can be purchased at the ticket centre in Hohenschwangau and you will be allotted a specific tour time. The ticket centre is open 8:00 am- 5:30 pm in the spring and summer months. In the fall and winter, it’s open from 9:00 am- 3:30 pm. To avoid the long line ups and ensure your desired tour time, we recommend buying your tickets on-line at minimum two days before your visit. There is a rather hefty reservation fee, but once we got there and saw the lineup, it was totally worth the extra money. There is a special ticket window for people to pick up reserved tickets. You can buy different combinations of tickets depending on which castle(s) you want to visit. We purchased the King’s ticket which allowed us to visit both Hohenschwangau and Neuschwanstein Castles (must be visited in the same day). 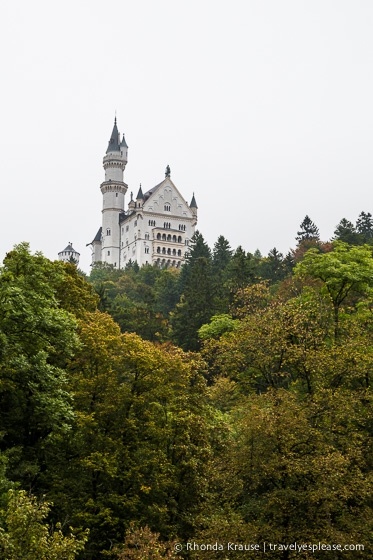 Tours of Hohenschwangau Castle are about 35 minutes long and are available in German, English or with an portable audio guide (available in Czech, Dutch, French, Hungarian, Italian, Japanese, Mandarin, Polish, Portuguese, Russian and Spanish). There are four paid parking lots in Hohenschwangau (€5/per day for cars). Parking is allowed from 8:00 am- 8:00 pm. *Information was correct at the time of publishing but can change without notice. Please confirm costs and times directly with service providers. Accommodations can be found in Hohenschwangau, at the base of the castles, or nearby in the beautiful little town of Füssen (about 4 kms away). 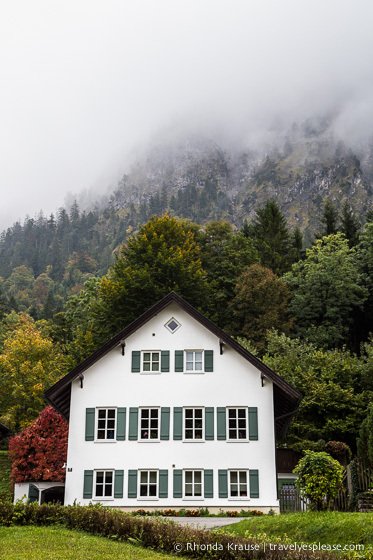 For your convenience, here is a list of hotels in Hohenschwangau and hotels in Füssen. Please consider booking your accommodations through the included link. It costs you nothing extra and helps support this website. Thank you! Frank - Nice photos (as always) Rhonda. I actually wasn’t a big fan of Neushwanstein – just found it too touristy and the interior too fantastical. There’s a reason they called Ludwig crazy :) Maybe being unimpressed also had something to do with the weather, was cold and raining non stop. Judging by many photos I’ve seen, part of the attraction with Neushwanstein are the incredible views from the Marienbruck. If there’s one tip I would have for anyone visiting that area: visit Reutte right across the border in Austria. Only 20 minutes away by bus and you’ll see some impressive ruins and great scenery.